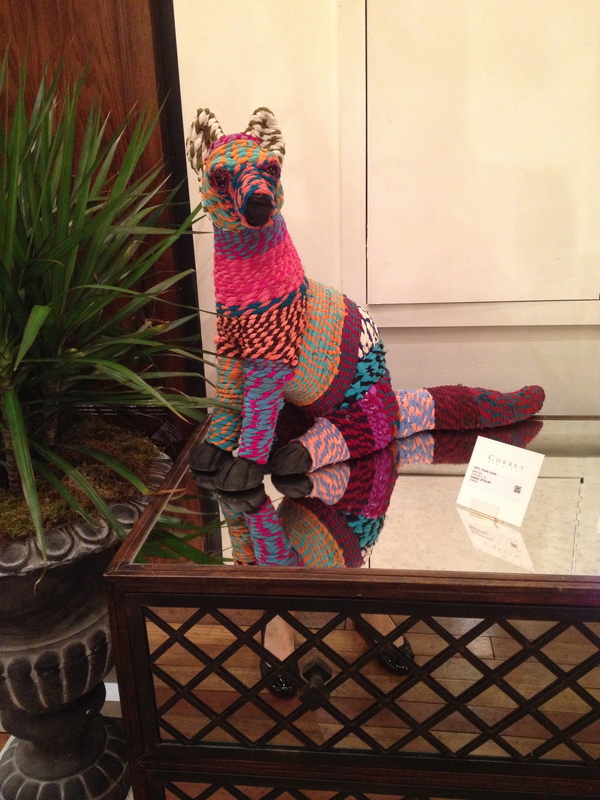 I attended High Point market this past weekend for the first time. Although I was only there for a whirlwind day and a half visit, I can’t believe how much I accomplished, learned, saw, enjoyed, and was inspired by. It is an experience like none other! One of my primary objectives in going to market was to see the latest and greatest in home furnishings designed with families in mind – you know, for the way we “really” live? 🙂 I have to say I am very encouraged by the apparent increased focus on tailoring products to this market segment. After all, it is a HUGE segment, and one that absolutely needs to be served expertly by designers and decorators. Let’s start with textiles. Holy cow, is Sunbrella having a moment right now! 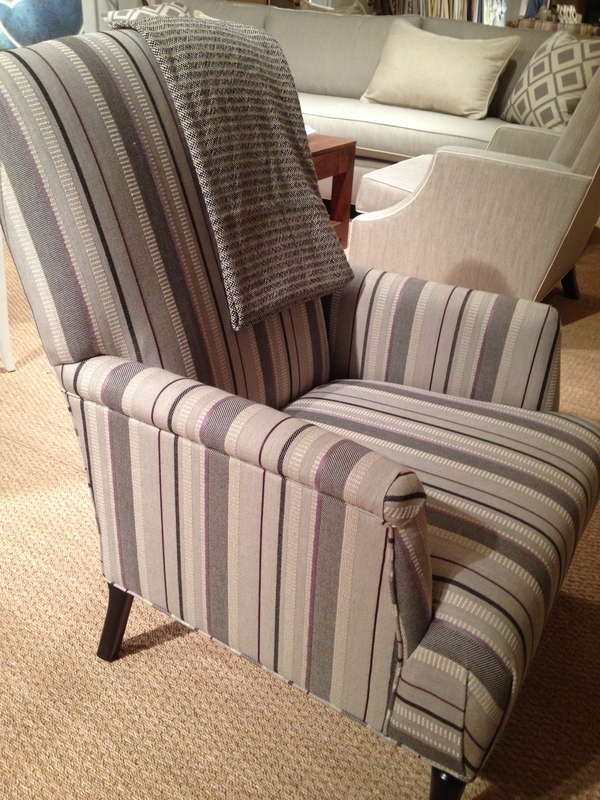 I was blown away by the sheer quantity of Sunbrella upholstery fabrics on prominent display (including on furniture) in many, many showrooms, including Vanguard, CR Laine, and Lee Industries. 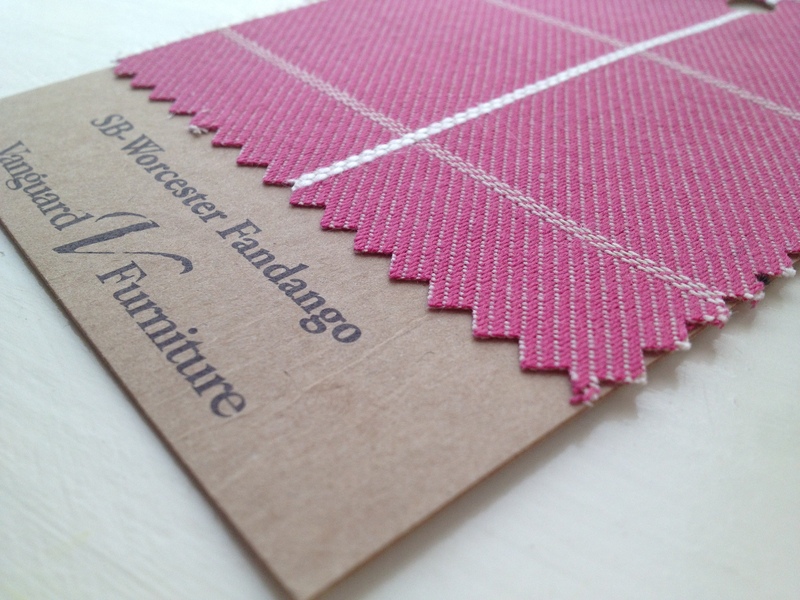 They have done a great job partnering with designers and furniture manufacturers to increase availability and use of their wonderful indoor-outdoor textiles. I blogged about Sunbrella about a year ago – if you’re not familiar, or you are but think it’s only for awnings and patio furniture, you should check out that post, too. 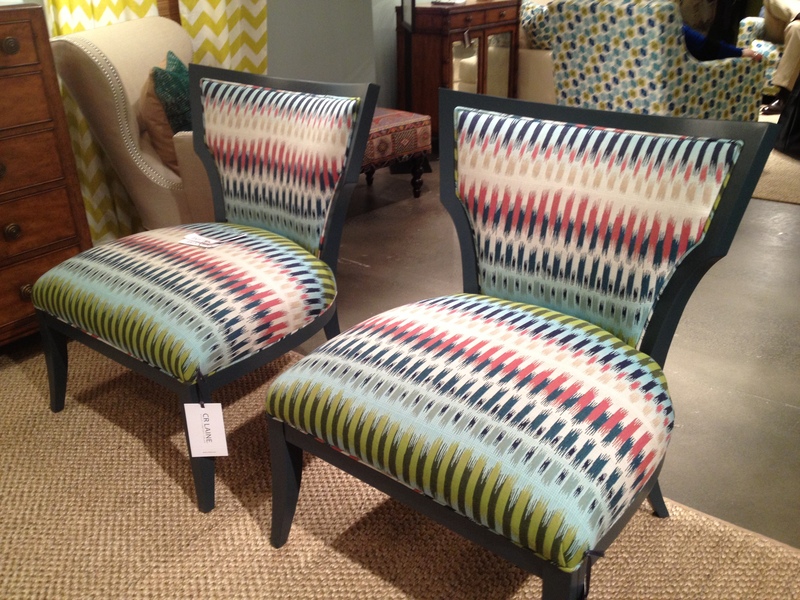 Joe Ruggiero designs a line of furniture and exclusive Sunbrella fabrics (100+) for Miles Talbott. His JOE upholstery collection is truly designed for family living, and features clean lines, transitional-to-modern styling, and, of course, his fabrics, which you would honestly never think were as easy-care as they are. 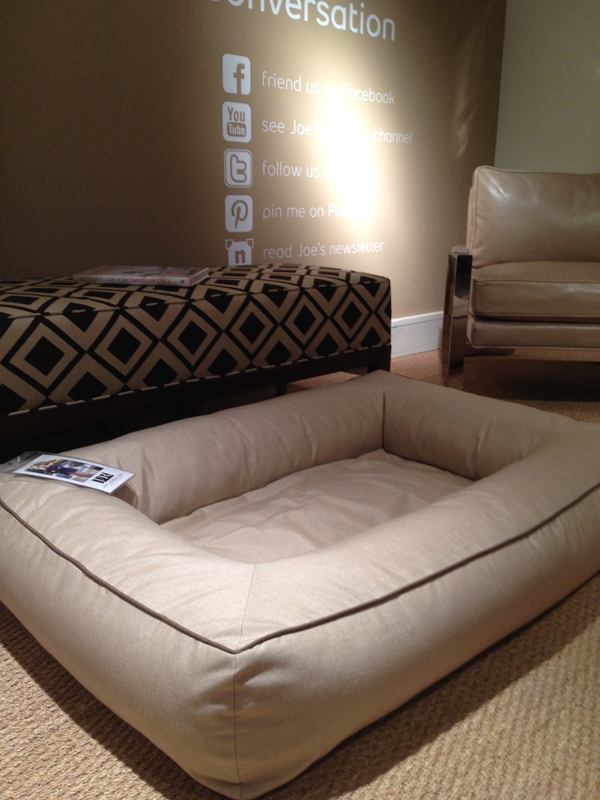 There is even a dog bed! My beagle is going to love this almost as much as I do. The fabric designs are on-trend, colorful, detail-oriented, and have a wonderful hand. I especially liked the menswear-inspired selections. My only regret was that I apparently missed meeting the man himself by a matter of minutes, since I decided to be an early bird and show up right at opening time. Nevertheless and needless to say, it didn’t take much convincing for me to fall in love with this line and everything it stands for. Sorry to have missed you, though, Joe! 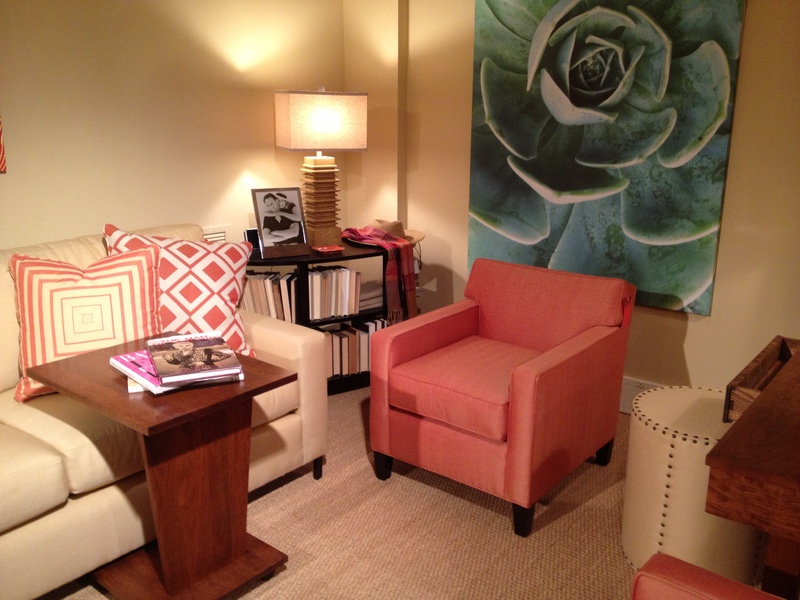 I also loved seeing great pieces at CR Laine upholstered with “made you look” Sunbrella. I mean, really, would you ever guess? This stuff can survive RED wine and pretty much whatever else you can dish out – and look fabulous doing it! 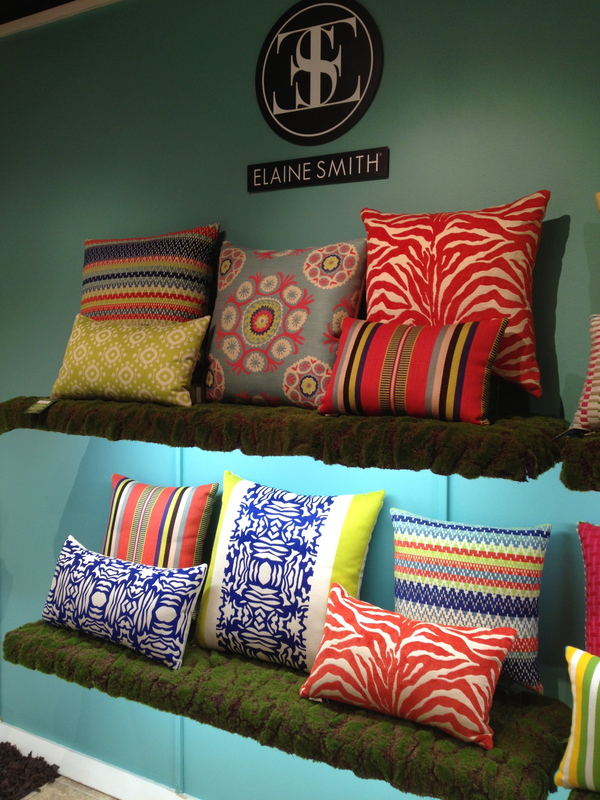 CR Laine’s incredible showroom merits far more than this brief mention. So you can look for more on them in an upcoming post. Vanguard had an entire wall of Sunbrella swatches in their fabric room. I’m willing to bet it didn’t look like that a year or two ago. I particularly fell in love with this one – which, to me, is a great way to do hot pink: toned down and masculine-ized a bit with a subtle thin-striped plaid pattern. 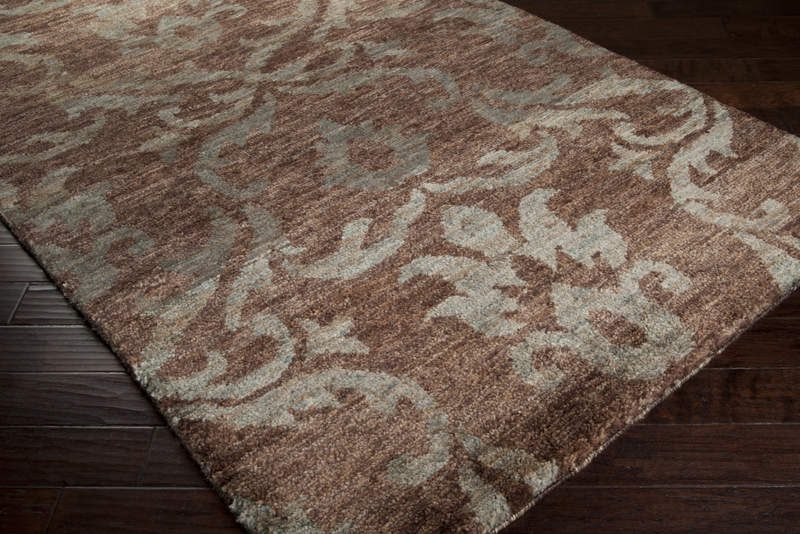 Next up…area rugs. I’m ashamed to say I don’t have much eye candy to share on this topic – my camera (aka iPhone) was near dead for a good part of my time there, so I was in battery conservation mode. What I can say is that indoor-outdoor rugs are still very much alive and well. I don’t feel like I saw any revolutionary new concepts or designs at market, but I was excited to see in person what I’d previously only viewed online from manufacturers like Dash & Albert, Loloi, Safavieh, and Surya (whose HUGE showroom was simply phenomenal). As for accessories and accents – oof, that’s a tough one. I’m honestly still trying to crack the code on kid-safe and family-friendly accessories – particularly, those that would be placed within reach or “tip-over distance” of small children. I did, however, find a few gems while at High Point. I spied these rag-wrapped (over papier-mache?) feline and equine sculptures at Currey & Company, a manufacturer known chiefly for lighting (their showroom was dazzling, by the way). They are nicely scaled and add a punch of saturated color where you need it, but they’re also lightweight and you won’t need to panic when Junior inevitably brings one down to the floor to play with. 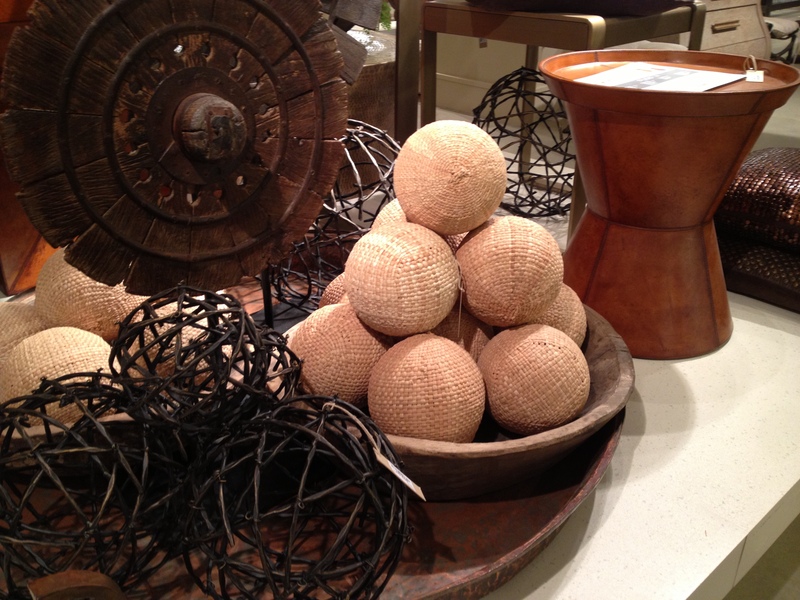 Not surprisingly, there are a lot of ball-type accessories available for filling bowls and baskets and such; many of these are made of wood, wicker, moss and other similar materials that are unlikely to injure or be injured. 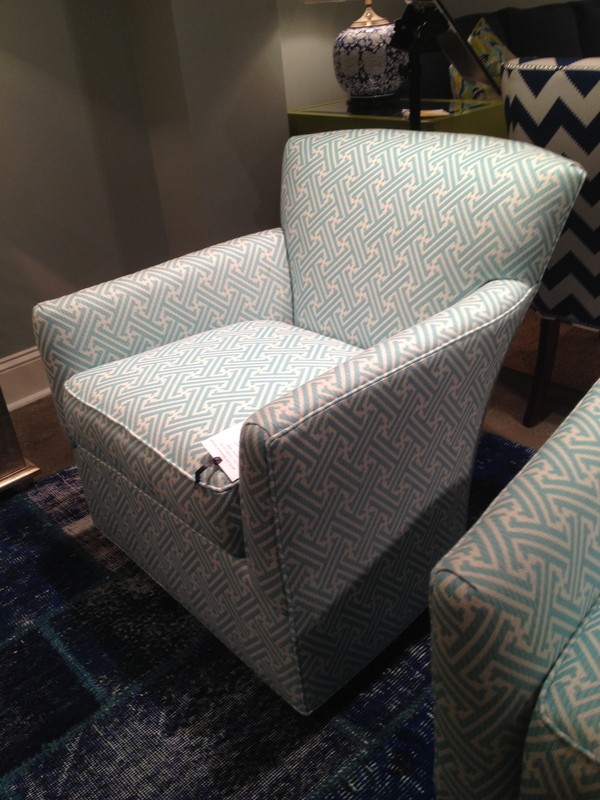 These were spotted in the expansive Global Views showroom. Please note: I can’t and won’t endorse anything from a safety perspective – you know your children best, and you alone are responsible for monitoring them in your home! These are just ideas to consider. Sorry, just had to say that! I really have to do a separate post on tips for accessorizing when small and/or careless children are present. The aforementioned Joe Ruggiero collection also offers well-priced Sunbrella throws (like the one shown on the JOE chair above), which look and feel great, but can be thrown in the wash.
Last, but not least, I finally had an opportunity to see one of Thibaut‘s textured vinyl wallpapers up on a wall. I know, I know, you’re like, VINYL? Really? 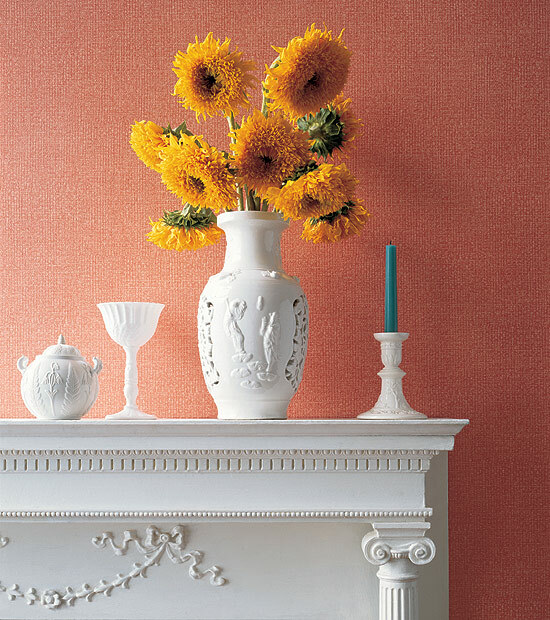 OK, here’s the deal – Thibaut makes a grasscloth-esque pattern on vinyl, so you can enjoy all the wonderful warmth and texture of natural wallcoverings without the negatives. Which, by the way, can be significant – grasscloth, though lovely, is very prone to snagging, water damage, and is not washable (sorry, moms); and some people can’t stand the inevitable ‘patchwork’ look that is created when the pieces hung on the wall. I’m telling you, the vinyl version is really quite nice – and yet, it’s washable (even bleachable), extremely durable, and utterly devoid of the seamed look you might not be that into. I’m also telling you, I forgot to take a picture of it :(. It probably wouldn’t have done it justice anyway. Here is a lovely shot from the Thibaut website, which shows the Grass Weave pattern in a pretty salmon color, which, by the way, popped up a lot at market. 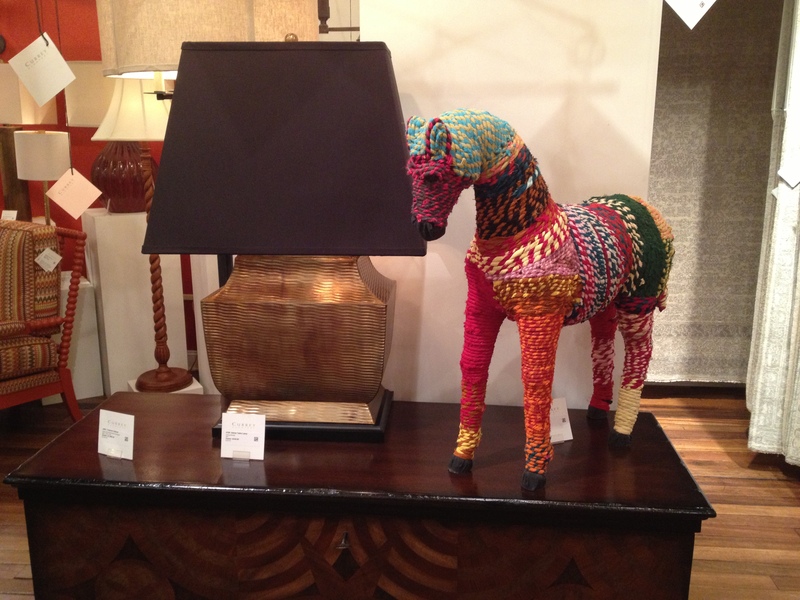 This is just the tip of the iceberg that was my visit to High Point Market. I will blog more about my experience there over the days to come. Need help navigating family-friendly design in your own home? Let me help you take advantage of the best that these and many other sources have to offer, and create a space that exudes your unique style…and fits your lifestyle. Learn more or contact me anytime; let’s chat! So glad I got to meet you last weekend at Market. My posts are almost ready, if you want to borrow any pics you’re more than welcome to! You too, Rachel! It was great fun to meet in person. About to read your Saturday post right now :).